No Suture! : Ridiculous Statist Nitwitery: The TSA is Looking for Bitcoin !!! 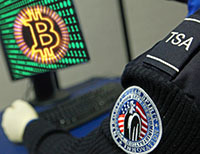 Ridiculous Statist Nitwitery: The TSA is Looking for Bitcoin !!! Bill and his wife were sitting on a bench in the terminal waiting for me as I approached them. Then two men stepped between us, both wearing dress shirts, one orange and one blue. The orange shirt asked where I was traveling to. I replied “Earth.” This was not intended to be antagonistic. I usually reply that way when asked where I am from. It’s a product of my love for science fiction. He asked me to be more specific and I said, “The Northern part.” Admittedly snarky, but still not malicious. I didn’t know who these men were. I had already been cleared by security, and based on their attire and their forwardness I thought they might be other attendees of the conference on their way home. I was joking with them, like I do with most equals. They identified themselves as “managers” and the orange shirt said he was obligated to inquire whether or not I was traveling internationally, which was not an answer to my question. I replied, “Am I obligated to answer your questions?” He replied, “If you are traveling internationally you are.” I replied, “Do you have any reason to suspect that I’m traveling internationally?” The orange shirt said “We’re the ones asking the questions here” and the the blue shirt asked to search my bag for my boarding pass. I told him that my bag was already inspected and didn’t contain anything dangerous, and that I didn’t consent to another search. He said until I was cleared by security he was free to search. I said I was cleared by security. I turned back to the orange shirt and asked “What did the Bitcoin look like?” Bill chimed in and told the agent that what he was saying was impossible because Bitcoin is digital and doesn’t have have any physical manifestation. You can’t “see” Bitcoin. Obviously, the TSA has been trained, although poorly, to look for Bitcoin. They are apparently now trying to catch money launderers in addition to terrorists, and large tubes of tooth paste. It was an open faced lie when they said they “saw” Bitcoins in my bag. Always remember bureaucrats can legally lie to you, but lying to them, even by mistake is a serious crime they’ll use as leverage to coerce further cooperation. They didn’t inquire about my phone, or my laptop, or my USB drive, which makes me think their Bitcoin training wasn’t very good, or that these particular bureaucrats didn’t pay very close attention. But, if the TSA is going to be looking for Bitcoin, they can use that pretense to search any person, at any time, to any degree. It’s entirely possible that a traveler could be carrying thousands of Casascius coins which are not loaded, and worth little more their value in brass. It’s also possible that a traveler could be carrying one Casascius coin that has been loaded with hundreds of thousands of dollars worth of Bitcoin. Technologically speaking the private key to a Bitcoin wallet could be embedded in virtually any object, including the brain of the traveler. It could be argued, in fact I would, that the Bitcoin is already on both sides of the check point, and carrying any kind of physical wallet is no different from carrying a debit card, or a pin number. It would even be possible for a traveler outside the TSA screening area to send any amount of bitcoin directly to a traveler already inside the terminal, and there’s nothing the TSA can do to prevent that. In the end it’s important for Bitcoin users to be aware of these Stasi tactics being used by the TSA. Maybe some Bitcoin users want to confront it directly with some kind of civil disobedience or demonstration. Maybe others will want to take extra steps to ensure they don’t face this added scrutiny. But this is what FINCEN meant when they said that Bitcoin could be regulated under existing law. They meant that the policy toward Bitcoin will be decided in secret, outside the legislature, by law enforcement bureaucrats reinterpreting old laws in new ways, to be enforced arbitrarily and inconsistently to evoke to greatest degree of doubt, confusion, and alarm.